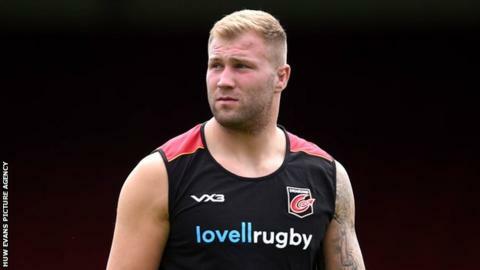 Ross Moriarty is physically back to his British and Irish Lions standard, says Dragons head coach Bernard Jackman. The 24-year-old was part of the 2017 Lions tour of New Zealand but picked up an injury in the opening game of the tour against the Provincial Barbarians. The 23-cap Wales international is set to play his first competitive game for the Dragons, against the Southern Kings in the Pro14 on Saturday. "Physically he is back to where he was for the Lions tour," said Jackman. "Off the field he has had a brilliant pre-season and is hitting personal bests in the gym." Moriarty was unavailable for the Dragons' opening Pro14 fixture, a 21-17 defeat to Benetton, through suspension. Jackman admitted whilst the number eight is physically back to his best, he will not be able to perform at his very best after missing out on game time. The back-rower has missed four weeks for grabbing Argentina fly-half Nicolas Sanchez by the neck during Wales' second Test match win against the Pumas. "Ross won't be at full-throttle, it will take game time," said Jackman. "He missed a lot of last season with injury but physically he is looking good but we all know how important game time is." The Dragons lost their opening league game to Benetton after only winning two of 21 league matches in the 2017/18 season.